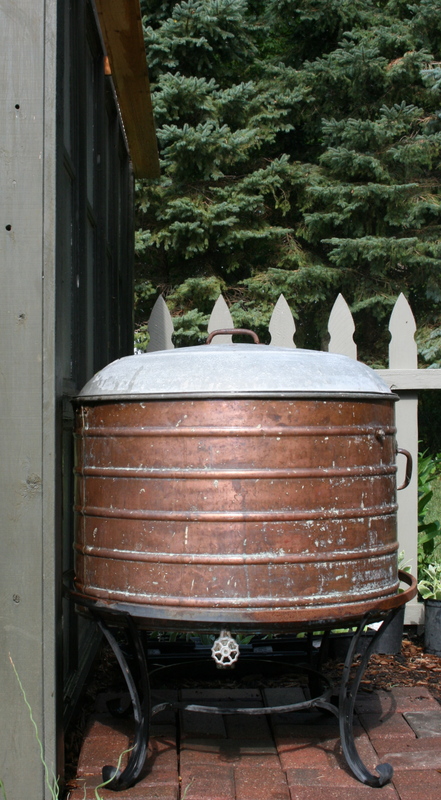 The copper rain barrel was my favorite addition to the garden this year. Now, if only we could get a little rain to fill it. They’ll bring pots of things to use as props…when will it run, do you know? Do you want some of our rain? There’s plenty of it! Apparently the jet stream which is giving us all this rain is responsible for your drought. It is stuck much lower down than normal and doesn’t look like it’s moving!! Great looking barrel. It certainly is a weird weather year! Northern MN just had terrible flooding and the Southern half is dry as a bone! I’m watching the farmers corn fields dry up before my very eyes. Hope you get some sun! It will be the early Spring Issue which I believe goes on the stand Dec/Jan. Country Gardens Magazine!! my favorite magazine….so excited and a nervous wreck. I was going to offer some of our rain but I see Wellywoman got in before me. The barrel is a thing of beauty!! Awesome! What a great find. No rain up north either? No rain here–although we are not “officially” in the drought zone–yet! This is really great looking! Not much rain here in the south either but with a cool rain barrel, I’d be hoping for some! Thanks for stopping by my blog.